The first observational study of a dung beetle species on Langkawi Island in the Andaman Sea reveals insights about its tastes and what that means for the ecosystem. A dung beetle inhabiting the Malaysian island of Langkawi prefers the faeces of an omnivorous long-tailed macaque, and is active only in forest areas, even though they can find the primate dung in other areas, according to research recently published in the journal Tropical Agricultural Science. The study's observational method could also be applied to other species to reveal insights into how they are responding to changing environments. Dung beetles perform many crucial roles in the ecosystem, from soil enrichment and nutrient cycling to seed dispersal and fly control. They are classified as rollers, tunnelers or dwellers, depending on what they do with the dung. The survival of these creatures is highly dependent on other animals, and affected by the environment. Recent work has shown that their numbers are decreasing in areas of Borneo, another island in Malaysia, where logging has taken place. Salmah Yaakop and colleagues from the Centre for Insect Systematics at the Universiti Kebangsaan Malaysia (UKM), and Universiti Tun Hussein Onn Malaysia (UTHM), observed macaque troops in a tropical mixed rainforest on Langkawi, an island off Malaysia's west coast that is an UNESCO Geopark site and popular tourist destination. When the team spotted the beetles in the act of rolling dung, they collected them, identified the species of beetle and analysed the dung. 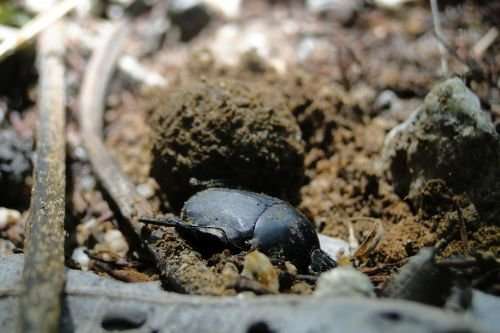 Although three species of dung beetle have been identified in Malaysia, the researchers found only one, Paragymnopleurus maurus, on the island that was active during the daytime. They show that these beetles exclusively choose the dung of Macaca fascicularis, which eats both fruit and meat as opposed to that of other macaques in the area which are vegetarian. Paragymnopleurus maurus is a large dung beetle, and more sensitive to forest disturbances than its smaller cousins because they need a large area with a large mammal population to survive. P. maurus has been seen elsewhere rolling and enjoying dung from other omnivorous animals, including carrion, pigs, cattle and even elephants, so the researchers speculate that it may have expanded its food preferences due to scarcity of usual sources. Given the importance of dung beetles for ecosystems, further work should be done to understand what about the primate dung attracts the beetles, and how this affects the dispersal of seeds consumed by the macaques. The methodology could be used to study other species interactions and will contribute to our understanding of ecosystem dynamics.